Mariners Latest: Just When You Think Things Can't Get Any Worse! Just When You Think Things Can't Get Any Worse! Humber's second win since last July! 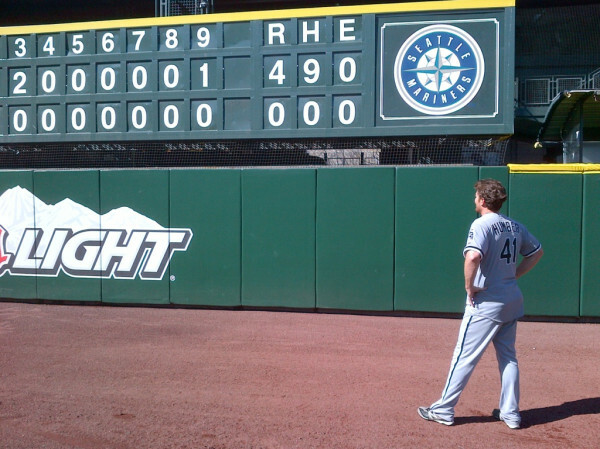 We could bask in the glory of Philip Humber and talk about the magnificent outing he had and that we all cannot believe the glorious pitching display that he put on today against the Mariners, but not me! I won't do it. Humber deserves credit for doing what has only been done 20 other times in MLB history, but there has to be some sort of asterisk beside his name in the Hall of Fame. Humber beat a Mariners team that went from the worst offensive team last year to being on the verge of even worse this year. If it weren't for our 7 games against the Oakland A's to start the series, we could be the very worst in baseball. We would be the worst offensive team already. Looking at our team leaders, we have only 3 guys above the .250 mark and everyone is below .300 and it's only April. Yesterday things went from bad to worse when the Mariners went 1 for 13 with runners in scoring position, in a game that unraveled quickly and only got worse offensively. I really thought that I was at my wits end with this team, I was happy in a sense because I knew things couldn't get any worse. Then this happens. A perfect game! Really? We weren't facing Roy Halladay or C.C. Sabathia, we were facing Philip Humber. Just the thought of this as a Mariner fan makes me want to puke. Not only do I not want to praise Humber for the sake that it was against a struggling Mariners offense, but in all reality, he choked in the ninth. The umpire got a bit overzealous in his called third strike and was completely wrong. I don't blame him, considering what happened to Armando Gallaraga in Detroit when the umpire stole his no hitter away on the last out of the game and was completely wrong. Now the tables are turned and I could really care less. I would rather see the guy get a perfect game than see Brendan Ryan stand on first with a walk and the next guy get out and we still lose 4 - 0. But, there is a sense of wanting the game to be called right too. Oh well. So, the key word moving forward, ACCOUNTABILITY! Wedge has preached it from the get go this year and the only place we have seen it is with Brendan Ryan. The you know what should be hitting the fan after a game like today and after one of the most horrendous weeks in Mariner history come to an end. We blew a 7 run lead, we blew a save after a Felix Hernandez gem, we went 1 for 13 with runners in scoring position and to top it all off, we got a freaking perfect game thrown against us by Philip Humber. I look at all the names in our lineup and it seems like we have a fairly decent team, I love a lot of the kids we have, but in all reality, we can't hit a freaking baseball to save ourselves. I don't know about you, but I have to start asking, is Eric Wedge the man for this job? He hasn't been given the best cards to play with since he's been here, but to me, we should be better than this. This is by far worse than last year. Something has to change. Somebody stop the bleeding. The crowds at Safeco continue to diminish. What a sad sight to see. Enough about Humber, let's look at the real issue and fix it! Thank You!! !